You may have heard us throwing out these words in the exam room or over the phone, but these two tests have very different meanings. You may notice a raised (or even flat) mass on your pet, which should prompt you to seek veterinary attention. From there, we may recommend one or both of these tests. A cytology is an evaluation of cells (‘cyto’ means cell). During your pet’s examination, we may aspirate (poke a needle into) the mass to collect a sample of cells and then spread them out onto a glass slide. From there, we stain the slide and look at it under the microscope. This test will show us if there are any abnormal (or normal) cells, microorganisms such as bacteria, or anything else that could be concerning. This test is relatively quick as we usually get the answer while you are still in the clinic; but on occasion we may need to send it to a pathologist (specialist) for evaluation. If we send out a sample, we usually get the results in about three days. Although this is a relatively non-invasive test and usually does not require sedation or anesthesia, this test has its limitations. We may not always get an answer as some masses do not exfoliate cells and the sample may not be a true representation of the mass. Thus, further testing may be required. Should the cytology not yield a result, a biopsy may be recommended. 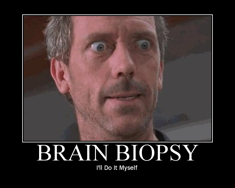 A biopsy is the lay-term for histopathology (‘histo’ means tissue). A biopsy collection entails brief sedation or anesthesia. From there, we may be able to get a partial or whole sample of the mass in question. We then send out this sample to the pathologist for evaluation. The turnaround time for a biopsy is about one to two weeks. With a biopsy, the full architecture of the sample is obtained and an answer will almost always be determined. Depending on what the cytology and/or histopathology shows, further testing and treatment may be warranted to give your pet the best care possible. As always, please do not hesitate to call us should you have any questions or concerns.